Is the Konmari method the best way to declutter your closet? Because new years means resolutions, Netflix has decided to welcome you with “Tidying with Mari Kondo” in lieu of a time consuming TV show. Well, it DID consume time to watch but wasn’t useless as it inspired me this first article of 2019. So bonne année ladies! I noticed than her job and mine are similar in many aspects. Our clients expect from both of us to improve their life by making something previously hassling into something enjoyable. In the case of Mari, your whole life by tidying, in mine, your confidence by styling. Aaaaan we both… LOVE MESS! The KonMari method, consist in applying to every household a two phased system. First sorting, their tidying by finding each item a confortable “home” within your house. During the sorting phase, you have to decide whether or not you keep an item depending whether if it “sparks joy” for you. Once rid of a ton a clutter (measurable in bin bags), you can proceed to install your beloved belongings in a rightful place. If you strictly follow her method, (detailed in her book that I have read), clothes are the first items you should proceed with. That is where I can compare both of our job, as, before beginning the styling, I start with a closet decluttering with my own clients. I her book Mari relates that her clients are nervous when they first welcome us in their house as showing the content of your closet to another person is something very intimate. Besides, you may be feared that the expert will judge your behaviour (he won’t, that what professionals are for). Yet, if we both declutter closet, we do not have the same method. In the show, Mari recommends her client to pile ALL their clothes (which includes accessories) in one big pile, called the “moutain” in order to create a shock of realizing how much they actually own. Before a closet editing session, I proceed pretty much the same way. Before my arrival, I ask my clients to gather all their clothes and accessories in one room. I also need my client to realize how much they own. Yet I do not require them to get their clothes outside of the closet which may be counterproductive in my practice: I need to see the clothes at quickly as I can you see. As our favorite japanese tidying expert narrates in her book, many people tend to forget what they own and therefore do not use everything they own. One of the reason is that they have forgotten where all their clothes are as they disseminate them throughout the house. One of the oddest places I have noticed in my practice, is to store clothes in their kids room. Usually they argue that there is not enough space in their to store everything. Yet, once the process of decluttering finished, there is. Another thing that KonMari narrates is the tendency of her clients to “hide things from her” as they say it is “not relevant”. It also happens to me all the time. Especially with jewelry. I ask to see what jewelry they own and they show me a little. Then I ask again, is that all you really own? And then they are like “oh I have this box of things I haven’t worn in years, it is not useful to show you”. But yes! I want to see the box. Often I do find a gem or two, and then, the rest is to get rid of (with the agreement of the owner of course ^^). Like Mari, I think those things you do not see clutter your mind. So to dress efficiently, you need a clutter free closet, that is a closet in which you love everything. In the show Mari recommend the “big messy mountain” thing. Yet in her book, the method is more civilized. She recommends to sort the clothes in categories before sorting them (the tops, the bottoms, the clothes on hangers, the socks, underwears, bags, accessories and shoes). the clothes they do not love anymore. I each category, my clients tend to keep the parting that was happening in their closet (tops together, etc), which is relevant enough for my purpose. Once the mountain erected, Mari explains her clients how to erode it. It’s pretty easy. The only criteria to decide whether or not to keep a clothing item is whether or not it “sparks joy” to them. I actually agree with the criteria although I think this should not be this only one to take into account. The concept of “sparkling joy” may sound abstruse to you but I am sure you already have experienced it. Take my exemple. If like me you are a scatterbrained person, you may have lost a piece of clothing. Did it make you sad? Did you crazy cuddle it when you eventually found it again? (just like Mari, I consider my belongings to have souls I guess). That, my friend, is an item that sparks joy. So if you do not know if you want to keep an item, wonder how you would react if a mean person would rip it apart. Relieved? Toss. Angry? Sad? Keep. Unfortunately, all is not all black and white in my own opinion. Maybe this scarf looks awfully boring to you. Maybe you find your satchel to be the most boring stuff ever designed. Maybe with the KonMari method you would have said bye bye and moved on to buying new ones (which is ok). But, let me work my styling magic and bang! There you own a joy sparkling bag with a colorful scarf-wrapped. I too am a closet fairy who can make your items spark joy again! So i was saying (sorry caught caught in fantasies), the huge difference lays in the identity of the supreme judge. The one who decides for each piece of clothing weather it gets to live in the cosyness of the closet or die in a moist bin bag. In Mari Kondo method, you are the supreme judge. She merely will help you find the true answer by asking you very accurate questions about your feelings toward the clothes. She is like a shrink for your relationship with your belongings. But that is all. You are the only one to decide. As she underlines in the book she is no clothing expert but she can detect whether or not a clothes makes you happy. I actually have this detection skill to. But sometimes I can see the beauty of stuff you got to unlove with my stylist eye. And show it to you. On the opposite, I can also make you realize that this dress you have cherished for years is not treating you well anymore. She had become tight, washed out, button missing maybe. But you can’t see this because you are still in loooove. I can open your eyes on this toxic relationship and make it end. Once your eyes are opened you get to decide whether or not you actually keep the clothes as you still are the supreme judge. But 99% you follow the lawyers advice (I am). I proceed with sorting the pile of clothes my client “does not love anymore”. Usually I agree with my client and toss it all. This is very rare for me to find extraordinary pieces in this pile. And even if I find an “ok” piece I do not try to save it and trust my client’s judgment. Whilst sorting, I ask my client why he got to not love those pieces which get me to know him or her better. Then I go to sort the pile of clothes that my clients cherishes and wears on a regular basis. Here I find interesting clothes as well as worn out, outdated or outsized clothes. I have to make my client’s eyes open on those facts so that he agrees to get rid of the once beloved items. When in doubt, I get them to try the piece. The pile of beloved yet unworned clothes is the last I proceed with. I have to confess it is my favorite as it sometimes contains amazing clothes my client have trouble styling. My job there is to find ways to wear them so that instead of being dormant in the closet they end up being worn and cherished. Instead of frustating (“I have no idea how to wear this”, “this is not something I can pull off”), those clothes begin to spark joy. In her book, KonMari have identified wrong reasons to keep clothes. As I have spotted the same ones in my practice, I 100% agree! keep it because it is a gift: as Mari, I think the main purpose of a gift is to be given. Once that task has been accomplished, there is no need to store it for many years. And to be honest after a year, the person who gave it to you probably has forgotten about it. keep it because it is expensive: if its value is the only thing you keep it for, then get rid of it. keep it “to wear home”: just like Mari Kondo, I am very strict on this one. If a piece of clothing is neither confortable or beautiful, then there is no reason to wear it at home either! That is usually just an excuse to keep unnecessary stuffs. Say good bye, I promise you will feel lighter. Eventually you can keep up to three tees and comfy pants for that purpose but that’s it! keep it “for gardening”: same story. One pair of dirty jeans and sweater is enough. Toss the rest. And when was the last time you did gardening? For our fav world’s famous tidying expert, if it does not spark joy, you do not keep. I have other criterias too. Based on personal memories. creating an heritage: as a teenager and as a grown up as was so happy when I would get cool clothes from my grandma and mum. I would cherish them even more than others because of their backstory. But when the 80’s came back I did reproach my mum to not have kept items when they were outdated. Therefore, I store a few pieces for my niece for when they will be cool again. creating a disguise storage: as a child I loved to play with the many stuffs my family has set aside for us to play with. As a grown up I still adore to play dress up and have a little storage for that purpose. Well, when I think of it, those clothes still spark joy in their own way. But keep them stored outside of your everyday closet! They are not clothing anymore actually. I find Mari’s relationship to items to be ambivalent. In a way they treat them as if they have a soul and thank them when they go but then… she toss them in ugly garbage bags!!! She seems not to care much about donating or recycling. According to her, donating is mostly giving the mess to someone else and finding the proper way of recycling just leads to keep the stuffs in the limbos of indecision. I agree that you shall get rid of the clothes as soon as you can but also that you shall lenghten their lifecycle by donating or recycling. Poor clothes: you would not want to murder them before they are completely worn out would you? (and poor planet you gave much of her to produce them). Yet, like Mari, I do not want my clients to have their clothes lingering in their rooms for weeks. So I forbid them to try sell on second hand platform. That is a hassle, takes lots of time to photograph the things, edit the sale on a platform and maybe you won’t sell them at all. donate to charities: all the clothes that have no value. Whether they still are wearable or not. The charities will either keep them or hand them to textile recycling compagnies. If you want to be helpful, sort them ahead. put them in a consignment store: only for branded items that are in excellent condition. Consignment stores are very picky because very few clothes actually are valuable. The consignment store is a much better choice than trying to sell you clothes by yourself as I explained above. If the store refuses your clothes, then they probably have no value and you may as well donate them. donate to loved one: Mari says that you shall not clutter loved ones closets with your old stuffs. I both agree and disagree. Instead I would say that you shall donate your loved ones only clothes that are in good condition, will suit them, and most importantly, will make them happy. To make sure about this, before handing the actual cloth in front of them and ask if they want it, why not text a pic message to ask if they are interested. This way they won’t feel obligated to accept. Mari has some interesting storage tips. Some are very logical, some are quite esoteric. 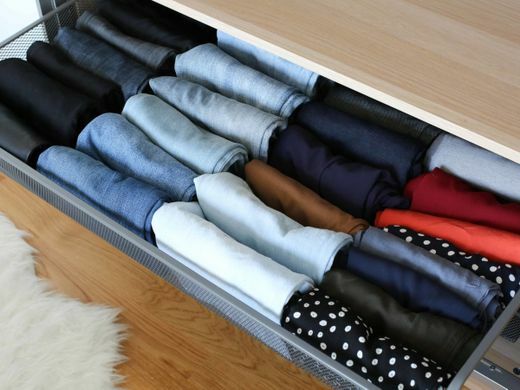 Her iconic recommendation is to store soft items vertically in drawer rather than to pile them on top of each others. I regret not to have read this before I had my new closet built. Some tips are a bit esoteric like storing your suspended clothes from long to short to create a happy diagonal. This will save you the pain of overlooking your sparkly tops every morning. If you have hired me, I may have noticed some pieces that you cannot wear until you have purchased new ones. Lots of peoples miss basic clothes that will combines with other pieces. The adjunction of those will make your wardrobe 100% functional. At the end of the closet editing session, I will have identified what you are missing and we will then go on for a personal shopping session together. When you will bring those items back home, you will make sure not to make the following typical mistakes both Mari and I have noticed amongst our clients. take the tags off: just like Mari, I am always utterly surprised by the amount of my clients who keep items with the tag on in their wardrobe. Usually they say it is “in case they want to sell it again”. Yet when you truly love an item, you should want to wear it immediatly and not even think of getting rid of it. If this is not your feeling then do not buy it. As long as the tag is on, the cloth is not truly yours. buy the same items twice at once: for instance, you see a little black dress, thing you will have a lot of use out of it and buy it twice. Wrong. Even for a basic piece, the odds are very high that, by the time the first items is worn out you won’t have any desire to wear the second one. buy the twin over and over: usually my clients do not realize they are doing this until, when sorting out the closet, I point out they have 10 of practically the same item like “long sleeved nay blue top”. Even if you get a lot of use out that kind of top you only need two of them maximum. If you are subject to that kind of behavior, try classify your clothes in subcategories. The tinier the subcategories the better. If you own too much of clothes that are alike then try not to duplicate them in the future anymore. As KonMari underlines, decluttering saves money in many ways. I am convinced the first step to a more responsible fashion consumption is to know your own style. With the proper methods, you will love getting dressed in the morning. So? ready to start 2019 on good bases with I and Mari? Great advice Alois. I’m fascinated by the planned simplicity of the way french women dress. I love the splashes of colour, detail or eccentricity! My girlfriends and I were discussing my unattractive sweater that has long lost any sparks of joy and we all agreed that some things you just keep because they serve a useful purpose (in that case, warmth). Thank-you for sharing your wealth of knowledge. Your articles and links are full of helpful information. I’m going to make a few bow ties out of my thrift store scarves to go with my white blouse! Always happy to know my articles are inspiring to some 🙂 Merci! Just discovered you and your article by accident bit once I’m able I will definitely be buying your book. Your writing abilities are amazing and I personally live the way you write, as it sounds like an actual conversation even if it’s just an article. Just wanted you to know you’ve inspired me to find some treasures in my closet. I think this should be done for kids clothes also because let me tell you I have 5 kids and just one of their wardrobes consists of 5 of mine. I have s harder time sorting through their stuff cause we have differences of opinions on what they look good in vs what they like to wear and what they FEEL good in. Whenever you wish for the book! As always great advice, thank you Alois, I am about to do it in my closet… urgently!. Besides I would like to say that I’ve finally got your book as a gift from my sister who lives in Europe….I am from Ecuador and it would have taken a long time to get here if I order it by myself, I am just love it , congrats !! And that I have reader in Ecuador!!! Another great post; thank you. I really appreciate how practical you are. Mari Kondo’s methods are great, but also a little extreme for me. I’m getting ready for another big purge and will probably reach out for another session with you. I just moved to a new home, and it is much colder here too, so I am finding my casual/at-home clothing needs to be different. Let me know for the rest! I love your posts. Well reasoned and detailed. En ce qui me concerne pour le style (et aussi la déco) j’observe la façon dont les comédiennes sont habillées dans les films & les séries, et en particulier les films de Woody Allen (pas Downtown Abbey même si j’ai adoré). L’été dernier je me suis inspirée d’une série suédoise « Meutres à Sanhamm » pour guider mes achats. Du coup je me suis acheté – entre autre – une paire de sandales sabots à talon mi-haut qui ont fait mes délices. Je voulais des talons un peu hauts mais confortables et surtout pas fins car j’habite dans une ville où il y a plein de rues pavées – la mort du talon fin -, et je trouvais ma démarche disgracieuse avec des talons compensés. Finalement les sandales sabots se sont révélées idéales, confortables et très légères contrairement à ce que l’on pourrait croire. J’ai regardé quelques épisodes de la série Kondo mais je ne me sens pas du tout concernée pour les vêtements / chaussures / accessoires. Quelque chose en moi résiste à la surabondance d’objets, ça me fatigue visuellement et mentalement. Par contre pour les livres, j’ai fait le tri et j’ai donné 5 mètres linéaires de bouquins à ma bibliothèque municipale qui s’est chargée de les ventiler de la façon la plus appropriée (bibliothèque, hôpital, etc). Cela fait longtemps déjà que je lis votre blog et je suis contente de pouvoir vous lire à nouveau. Certains de vos articles m’inspirent, comme par exemple le port du jean blanc en hiver. Merci! Par ailleurs je me suis procuré l’application Cladwell il y a quelque temps et je trouve cela assez bien car elle propose des combinaisons auxquelles je n’aurait pas pensé; çà évite la répétition automatique d’association de vêtements/chaussures. Du coup j’ai l’impression d’avoir plus de choix de tenues et même d’avoir plus de vêtements. J’adore les sabots suédois, je porte ça tout l’été pour gambader dans Paris! This is what I love about your advice, Aloïs — you take tips like Kondo’s and make them specific and applicable (no more than two twin garments, three comfy housewear items). I need house-only items to change into as soon as I get home as pet fur and kitten claws ruin my “real” clothes. On your advice, I will find 3 of the nicer-looking ones and purge the rest. It’s true that a neat closet stops me from overshopping and keeps my life simple. Merci!